If you’re searching for a cordless phone that’s suitable for use with our Diallers, or just an additional phone, we recommend DECT (Digital Enhanced Cordless Telecommunications). The most widely used worldwide digital cordless technology, DECT offers amazingly clear sound, long range and maximum voice security. DECT operates on the 1.8GHz frequency which eliminates potential interference from other common wireless devices, such as wireless networks (WiFi), Bluetooth and cordless computer devices. 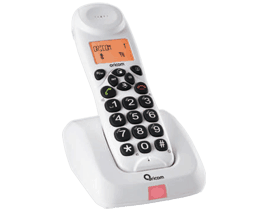 Speak to our staff about adding a cordless telephone handset. Click on the picture or title below to view or download the product data sheet.